The Japan Society took a much deserved day off yesterday after a whirlwind opening weekend of Japan Cuts 2011: The New York Festival of Contemporary Japanese Cinema. Seven of the first ten screenings were sold out, a tremendous start to the festival’s fifth year. 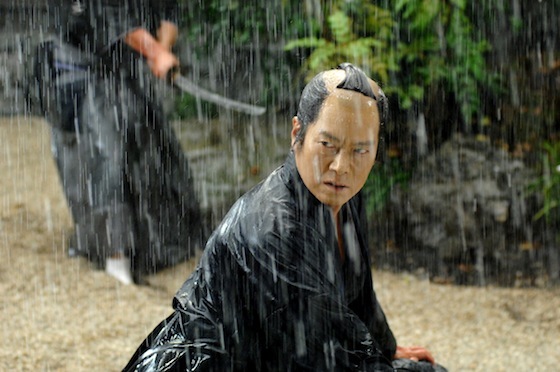 Japan Cuts resumes tonight with two samurai films: Sword of Desperation and The Last Ronin. The L Magazine describes Sword of Desperation as a “slow-boil samurai melodrama” and one of the festival’s strongest films. Read Simon Abrams’s review here. The most recognizable samurai story is that of the 47 ronin, masterless samurai who avenge the death of their lord then commit seppuku (ritual suicide) afterward. Numerous fictionalized versions of the historic event have woven their way into Japanese popular culture; the tale of the 47 ronin has been immortalized in ukiyo-e prints, kabuki plays, and films. Right now The Last Ronin is the latest interpretation of that story (one starring Keanu Reeves is scheduled to be released in November of next year). The Last Ronin takes place sixteen years after the revenge plot, with Kichiemon Terasaka (Koichi Sato), the uprising’s only survivor, searching for the families of the fallen samurai. In the process he runs into Magozaemon Senoo (Koji Yakusho), an old friend who betrayed the samurai by fleeing the day before the insurgence. Can Magozaemon keep the secret he’s guarded all these years from his dear comrade? Tickets for each screening are $12/$9 Japan Society members, students, and seniors; and $16/$12 for the July 15 screening and after party (Into the White Night‘s screening/closing party is regular price). Tickets can be purchased in person at the Japan Society at 333 East 47th Street, through the box office at 212.715.1258, or online at www.japansociety.org. Those purchasing more than five tickets for at least five different films receive $2 off each ticket, but you must call the box office or make your purchase in person.